The new Eaton Room takes inspiration from the authentic surrounding Jordan neighborhood through its sleek new designs, and is packed with features including an ultra comfy certified organic mattress, 43" Smart TVs and bespoke work desks with USB charge to enhance your process. Take this chance to enjoy the most modern, comfortable, and conscious dwelling in the hotel at no extra cost to you. Set in the buzzy heart of downtown Kowloon, Eaton HK is a dynamic property that features smartly designed guestrooms and suites, an exciting mix of international culinary outlets, and creative event spaces that make the hotel a hotbed for Hong Kongers and international travelers alike. Guests can retreat to the stylish decor and comforts of their rooms or step out and dine at the all-day retro-inspired eatery The Astor or Michelin-starred Cantonese restaurant Yat Tung Heen, snack at 11 curated food stalls in the Foodhall, take drinks at open-terrace cocktail bar Terrible Baby, or get fit at the rooftop Wellness Center with swimming pool, yoga studio, 24 hour gym and juice bar. Its all here for you at the new Eaton HK. 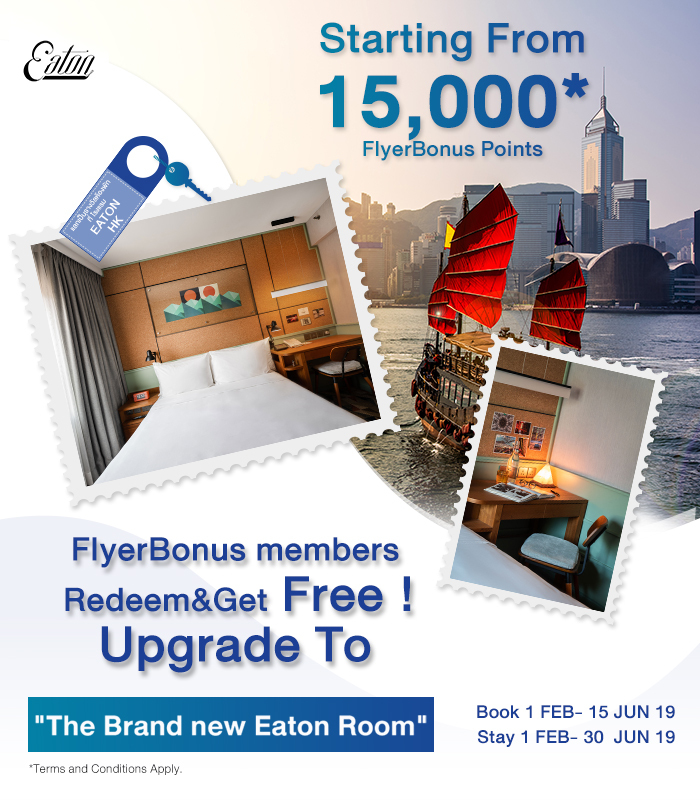 This offer only applies to qualifying FlyerBonus Members who redeem hotel awards and made online reservation only via www.eatonworkshop.com/hotel/hong-kong and using the code "PGRED" within the booking period 1 February – 15 June 2019 and stay during 1 February – 30 June 2019. This is to upgrade room to "The brand new Eaton Room" for FlyerBonus members who redeem to stay at Eaton Hotel HK. Cancellation policy will vary according to each hotel. Promotional Room will not be applicable during Blackout Dates. Contact hotel for details. Taxes, Fees, and Surcharges are additional and vary by hotel. Contact hotel for details. In the event of any dispute or argument, the decision by Eaton HK and FlyerBonus shall be absolute and final. Eaton HK reserve the right to offer alternative benefit should the one listed above be unavailable. For more information or for further assistance with your booking you may contact our reservation centre at rsvnhk@eatonworkshop.com or +852 2710 1828.